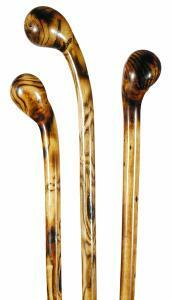 A very smart version of the traditional ash knobstick that has been grown and used in Britain for centuries. Produced using the coppicing method, these sticks are formed from the shoot that grows when the upper part of a young ash tree is removed. The bark is stripped away to reveal the bare wood underneath. This is scorched with a flame to bring out the beautiful pattern of the grain and then the stick is polished. Height 97cm (38"). Fitted with a metal ferrule.